Most people have no idea what that means. What it means to me is that on many days I am using an entrepreneur mindset to advance the social cause of suicide prevention. It also means I like the nimbleness and flexibility of working solo. 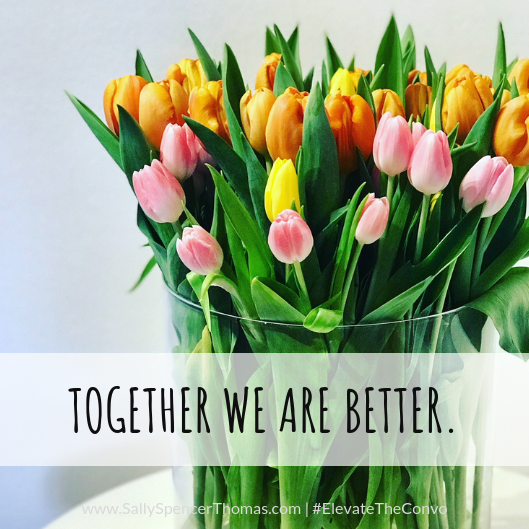 This week, I am reminded of the many ways we need each other. Here are just a couple of ways this theme of interdependence is showing up in my life in just the last few days. These three lessons I’ve learned this week illuminate how our deep, reciprocal connections matter. I have a friend who is going through a rough patch in life. For I couple of weeks I sent “non-demand caring contacts” to say “I notice you. I am here. I value you.” I texted pictures of adventures of our past, videos that make us laugh, and future goals we aspire to. No requests. No checking in on progress. Just “I care about you” messages. People have often done this with me — little nudges of compassion and acknowledgement — and I feel a deep connection to them. This effort is relatively easy, but one we often don’t make time for in our conspiracy of busyness. Having friends we can lean on when we are feeling down is one of our most powerful weapons against suicide. WHO ARE YOUR 3 O’CLOCK IN THE MORNING FRIENDS? Who are the people you know will show up for you no matter what — even if being there for you inconvenienced them? If you don’t have people like this in your life, how can you build these types of connections? How are these relationships reciprocal and built around trust? Start now by sending a “non-demand caring contact” to someone you care about. Just text in your own words something like “you just crossed my mind, and that my world is better because you are in it” and see what happens. When we bring diverse partners to the table, competing agendas can get in the way of progress. This week I was reminded about the richness of thinking and effectiveness of problem-solving when we bring together new perspectives. At the 4th International Zero Suicide Summit last week in Rotterdam (Netherlands), our speakers included a mathematician, a workplace safety expert and a corporate marketing professional. How wonderful it was to think about how their areas of expertise informed our mission to aspire to zero suicides. Mathematician Marten Scheffer explains the math behind the tipping point phenomenon. HOW DO WE BRING IN NEW AND NEEDED VOICES TO THE TABLE? Who is missing in our conversations about suicide prevention? Who can stretch our thinking? We need to break out of the tribes within which we are comfortable. Who are we forgetting? Who can give us new insights? Sometimes this means new sectors, industries or experts. Often it means integrating people with lived experience whose input transforms our thinking. Many people wore yellow ribbons on World Suicide Prevention Day to honor their losses and forge solidarity in the fight against suicide. I am consulting with the Colorado School of Mines, a small university near my home that has experienced more than their share of tragedy over the past few months. 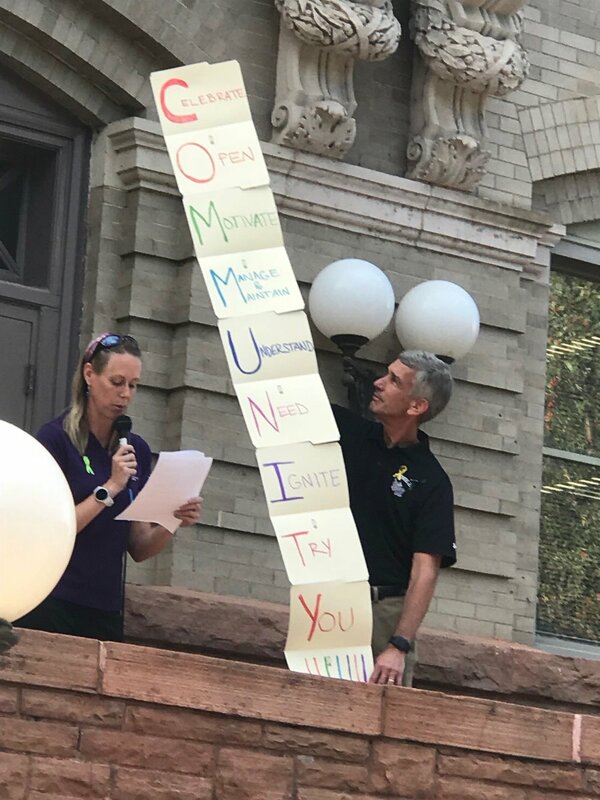 On World Suicide Prevention Day, I witnessed students, faculty and staff come together and honor the strengths of their community in the midst of their grief. Hundreds of students, faculty and staff gathered — with tears and cheers — to lean on one another. Together they acknowledged their losses and their love, and the power of that moment was felt by all. HOW DO WE FORGE CARING COMMUNITIES? Colorado School of Mines President Dr. Paul Johnson holds up reminder of what helps the school thrive. We acknowledge that we have all been impacted by suicide in one way or another, and we disclose our vulnerabilities. We proactively reach out when we know people are going through tough times. We recognize and reward kindness, authenticity, empathy and total wellness. So at this time of strategizing, I say we stand shoulder to shoulder. Maybe locking arms in solidarity or maybe embracing in a much-needed hug. We are stronger together. We are smarter together. We are better together. Please, feel free to share this graphic. All we ask is that you link your post back to this article.